What to do if your sleep isn't calculated correctly. AutoSleep 5 has a new Adjust button that helps you set your sleep/wake detection settings based on sleep style and solve any other problems that may exist. You simply touch the Adjust button below the clock and it will ask you a series of questions. It will explain and confirm your night hour setting which controls the window of time for this day that sleep is auto tracked. It will also let you change this. If you used "Lights Off" it will confirm your time and let you change it. If there is any doubt, it will ask you whether or not you wear the watch whilst sleeping. If you don't wear the Watch when sleeping, and have iPhone movement detection turned on it will show you all the times that the iPhone said that it was being moved and let you turn this feature off. It will show all the times that no data was received from the Watch. This includes time on charge and lets you determine if the problem is due to your Watch not sending any data from its sensors. If so you are then directed to a comprehensive troubleshooter. 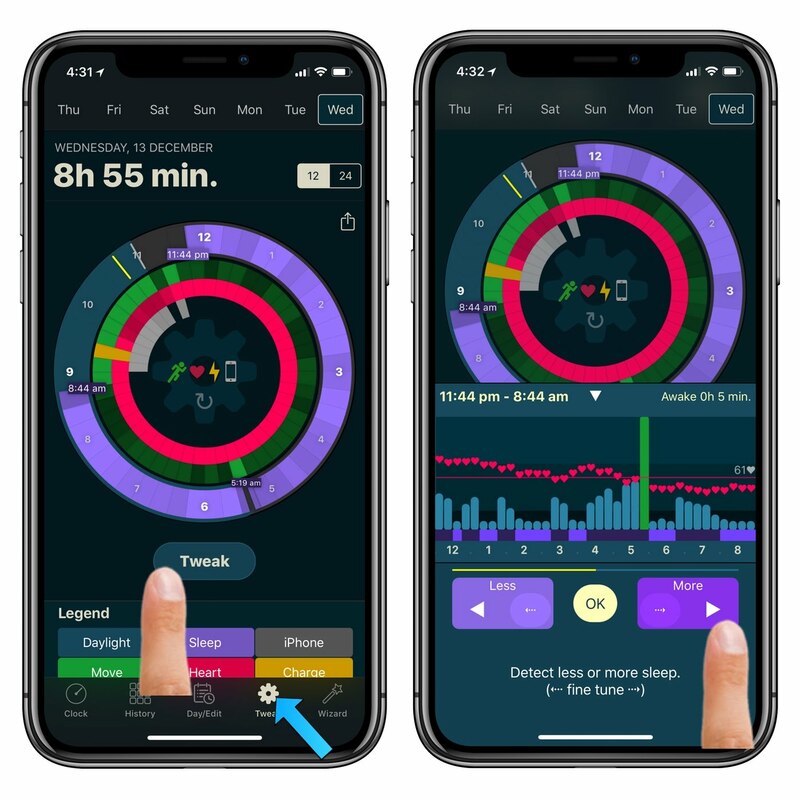 If you do wear the watch when sleeping it displays a simple panel that lets you choose your sleep style and automatically re-calculates your sleep. Finally, if all else fails, you can edit sleep manually or get support. If you wear the Watch to bed you will be asked if you want to adjust your auto sleep/wake detection based on your sleeping style. You simply dial in your sleep style, e.g. still, average, restless and you'll see the sleep clock, sleep time, awake time, sleep start / finish, quality and deep sleep all change to reflect this sleep style. You can swipe up the sleep analysis graph (or touch its title bar) and this will let you see how it would appear if you change your sleep style. When you feel that this accurately reflects your sleep/wake time then press OK. The app now uses this as your new automatic sleep tracking setting. Some people naturally move around more in their sleep. Some people like to track awake time only when they get out of bed, some people like to track it in bed. These settings give you the flexibility to choose the method that works best for you. When you get more experienced, you may not need to go through a step by step troubleshooting process, and instead, just tune the detection directly. Or perhaps you just want to tune more finely instead of using a preset sleep style. You can do this by pressing the Tweak tab. This shows you the data that the app has used to make sleep detection decisions. You can scroll down to see an explanation of the coloured rings, or just touch the centre of the clock for an explanation. To adjust sleep/wake detection, you press the Tweak button. You press Less to see less sleep and more awake time. You press More to see more sleep and less awake time. There are also fine adjustment arrows for Less & More that will let you make very fine adjustments.